The T2™ probe is a robust, oil-permeable fiber optic temperature sensor for use inside oil-filled power transformers. It is specifically designed to withstand initial manufacturing conditions, including kerosene desorption and heat runs, as well as long-term oil immersion and vibration. The probes can be embedded in a standard spacer or attached directly onto any other location inside power transformer windings. The T2™ probe consists of a 300-micron O.D. solid-state sensitive element bonded to an optical fiber. This fiber is covered with a 1.06 mm O.D. oil-permeable protective PTFE Teflon sheath. The entire probe is protected by a 3.1 mm O.D. PTFE “spiral wrap” reinforcement. Only chemically resistant and low dielectric constant materials are used for these temperature probes. The protective sheathing over the fiber optical temperature probe features a single continuous slit along the entire length of the tube wall, which allows perfect impregnation of transformer dielectric oil into the inner section of the probe assembly. Competitive products use numerous diagonal slits, which degrade the sheath’s ability to protect the fiber during transformer manufacturing. 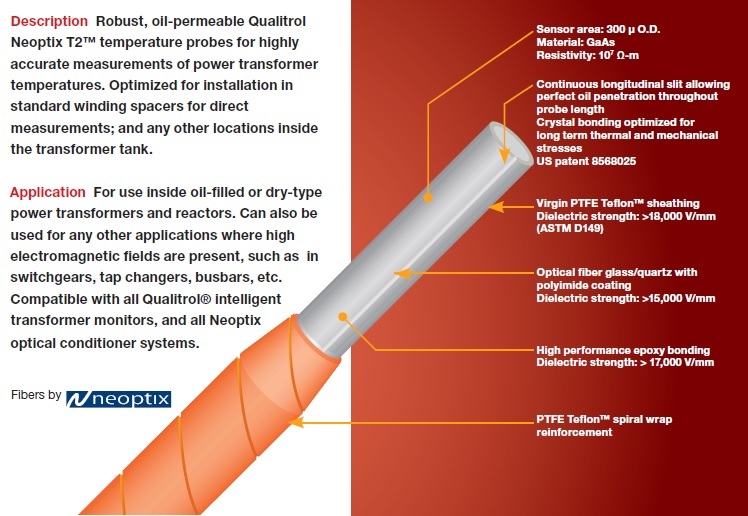 Since the sensitive element of the Neoptix T2™ temperature probe is completely enclosed in the tip of the Teflon sheath, there is no risk of this element becoming detached during manipulation and installation. There is no external bonding, which creates a protuberance of adhesive around the sensitive element that can allow force to detach the optically sensitive part. The optical cable is bonded onto the protective sheath near the sensitive element with high-temperature epoxy and fluoroplymers. Neoptix T2™ temperature probes comply with ASTM D2413 and D149 standards. It is also delivered with a temporary Viton protective cap over the ST connector to prevent dirt to become in contact with the connector during assembly and heat runs. The T2 probe has also been tested for partial discharge; it was found to be lower than 5pC. The T2™ temperature range is -80ºC to +250ºC. All T2™ optical temperature probes are available in custom lengths from 1 to 25 meters. The T2™ is compatible with all Neoptix instruments and accessories such as extension cables and optical tank wall feedthroughs. As all Neoptix probes, the T2™ does not require any recalibration or complex «gage factor» input to operate. The small optical fiber diameter allows very sharp bending radius. The Neoptix T2™ sensors are now available with a retaining disk option, as shown in the "Literature/Images" tab of this web page. Neoptix T2™ optical temperature sensors perfectly mate with all of our signal conditioners including the handheld Nomad™, our T/Guard™ product family as well as our Reflex™ and OmniFlex ™ fiber optic signal conditioners. The sensor is delivered with a NIST traceable Calibration Certificate.